The Vinfinity W. B.T.G. Spoilage Calculator uses point of sale data from several major restaurants and sophisticated mathematical modeling to estimate wine spoilage based on the number of selections offered, glasses sold per month and number of days at which management considers an open wine unacceptable. • 25% average wine cost. For more input options please click here. *Spoilage calculations in the With Vinfinity column assume a spoilage point of seven days, which is the most conservative scenario when the system is used as intended. In most cases, Vinfinity will keep wine fresh for up to 21 days. Wine-by-the-glass makes more sense than ever. Consumers want the flexibility to experiment with new wines and match their individual menu choices. Restaurateurs want the higher margins, turnover and sales. If selection, quality and price were equal, there would be no reason to order wine by the bottle. But they are not equal. By the glass selections are usually a fraction of the total list and limited to the most popular varietals. Super premium wines are rarely available. Quality is unreliable and operators charge a premium to account for spoilage. A practical, scientifically sound and cost effective solution. 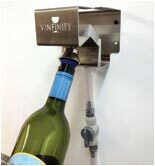 The Vinfinity® System represents a breakthrough solution to one of the wine industry’s most enduring challenges. Vinfinity allows you to deliver pristine quality in every glass, eliminate losses and maximize profits. Our patented FlashVacuum™ technology removes the optimal amount of air in an open bottle in less than 2 seconds. This quick response allows you to vacuum seal every bottle after each pour, thus minimizes contact with air and extending the drinking life of an open bottle for up to three weeks. 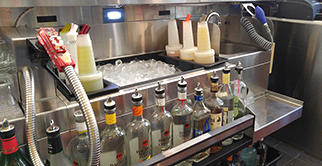 The system offers unlimited bottle capacity, is highly reliable and easy to install and use. It requires minimal bar space, no regular maintenance and has negligible operating costs. Vinfinity has been awarded several US and international patents and is in use at some of the best known corporate and independent wine programs in the industry.